Did NASA try to hide UFO watching Space X Dragon departure from ISS? On Saturday morning, October 25, the Space X Dragon detached from the International Space Station (ISS) as it began its return mission to Earth carrying various cargo items. In NASA’s video footage of the Dragon departure, uploaded the same day to Youtube, a small luminous UFO is apparently monitoring the detachment and start of Dragon spacecraft’s return which conducts three burning maneuvers near the ISS. Video analysis of NASA’s coverage of the incident was conducted by Third Phase of Moon that clearly identified the UFO. Furthermore, Third Phase of Moon makes the remarkable claim that NASA deliberately tried to hide the UFO as it monitored Space X Dragon’s departure. 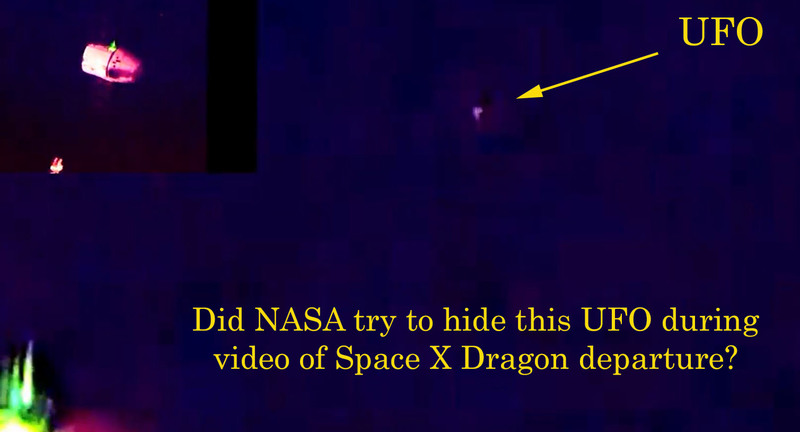 In the raw footage of the incident provided by NASA, it is hard to identify the UFO which is a small light just above and to the right of the Dragon spacecraft. According to Third Phase of Moon, this is because NASA zoomed out from the Dragon craft as soon as the UFO appeared nearby. After NASA’s raw footage is subjected to video analysis through zooming and light contrasts, the UFO becomes clear. 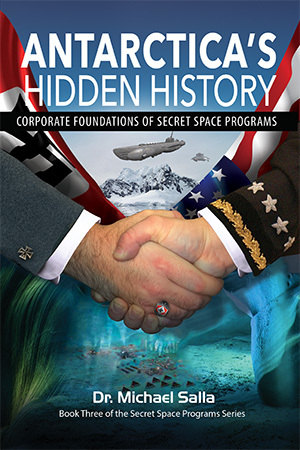 Was NASA’s zooming out at the moment the UFO first appeared merely coincidental; or, as Third Phase of Moon claims, a deliberate attempt to cover up the UFO? The Space X Dragon incident follows only three days after another small luminous UFO appeared near the ISS, this time during a spacewalk by two Russian astronauts. The UFO was very clear and appeared to maneuver near an object jettisoned by the astronauts. A day before, on October 21, two cigar shaped UFOs appeared near the ISS. In another incident on October 7, an elliptical UFO appears nearby another spacewalk by two astronauts. The October 25 incident suggests that once again, a UFO has been filmed apparently monitoring ISS activities. 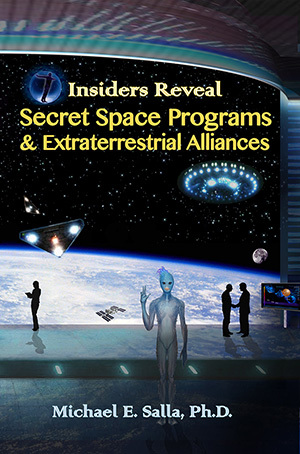 If NASA was trying to cover up the latest UFO incident, this may be part of a deliberate policy of countering the frequent appearance of UFOs near the ISS that might lead the public to conclude that we are not alone. Did NASA live video capture extraterrestrial life during spacewalk? ← Did NASA live video capture extraterrestrial life during spacewalk?